Flamstead author Ian Ridley has swapped the buzz of sports books for the excitement of writing a thriller – and is selling copies in the village shop to help raise money for the St Leonard’s roof appeal. 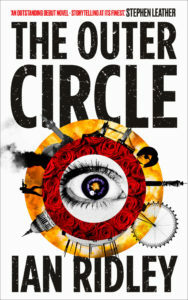 Ian, writer of 12 sports books including Sober, the recent Sunday Times bestselling autobiography of former Arsenal and England captain Tony Adams and sequel to Addicted, has just seen his debut novel The Outer Circle, published by Unbound. The book takes as its starting point the day after the closing ceremony of the Olympic Games in London 2012 and imagines a lone figure walking into Regent’s Park Mosque in London to commit an atrocity. From then on it follows five very different characters caught up in the drama, including a national newspaper journalist and a young Muslim, before a dramatic ending five days later. A donation of £1 from each copy sold in the village store will be donated to the Flamstead Heritage Project for the church roof.